From Newcastle to Newcastle: Brian Burnie from Newcastle-Upon-Tyne arrive in Newcastle, County Down, on his mission to provide a million hours of transport for cancer patients to attend their treatments. Charity founder Brian Burnie (74) is walking the entire coast of the Island of Ireland on a six month, 2,000 mile challenge to promote free cancer patient transport across the UK and Ireland. And Down News caught up with Brian as he arrived from Newcastle-Upon-Tyne in England on his journey and passed through Newcastle, County Down, on Thursday 11th April. Remarkably, Brian is a Parkinson’s sufferer, and he arrived in Newcastle County Down on World Parkinsons Day. 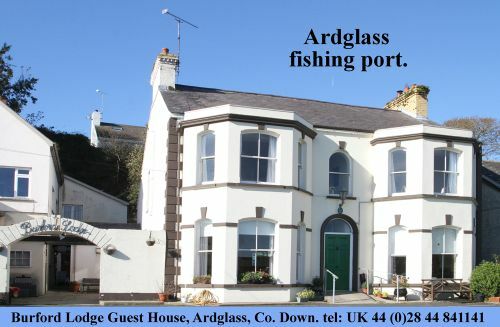 In County Down Brian and his wife Cheryl stayed at a B&B in Attical and he said: “The view from the front window down to the sea was absolutely magnificent. This is such a beautiful place. Brian was a retired consultant problem-solving engineer, and he admits that he is using his life-long professional problem-solving skills to address a fundamental issue in the health service, the transport of cancer patients to their treatments. To raise awareness about his mission, to provide a million hours of patient transport, he has walked over 3,000 miles around the coastline of Scotland, Cumbria, Lancashire, Merseyside and North Wales. Last week Brian Burnie arrived in Dublin to continue his 7,000 mile walk around Great Britain and Ireland. Brian has been instrumental is setting up the North East England-based Daft a Brush Cancer Patient Care which offers 30 staffed custom-made vehicles to transport outpatients, free of charge, to and from hospital, where they are undergoing chemotherapy and radiotherapy cancer treatment. Brian is looking forward to this new chapter in providing this cancer care facility for sufferers. He said: “Who would ever have thought we’d be on the Stena Line Adventurer from Holyhead to Dublin? It’s quite stirring actually as I’ve now walked over 3,000 miles to this point. When we arrive in Dublin, I start walking anti-clockwise towards Belfast and around the island of Ireland. I feel this is a very special time for us – a new chapter of the walk begins. Ireland, here we come! “My wife and I planned to live on a double decker bus, ‘the Bluebell’ for the duration of the Ireland trip but the bus developed a valve issue and is being repaired thanks Bus Éireann who have been extremely helpful. Walking up to 20 miles a day is testing for Brian, who is also dealing with the effects of Parkinson’s disease. He said: “I fully admit I have struggled at times, but chatting to people I meet and the support from my wife Cheryl, really keeps me motivated and determined. Newcastle-Upon Tyne’s Brian Burnie, an inspirational shaker in Newcastle County Down on a mission. He wants to set up UK and Ireland wide transport for cancer patients to their hospital treatments. “My feet are in good shape and I don’t carry any rucksacks so I can walk freely which is much more comfortable. I am amazed at the friendliness of the people here and also the beautiful countryside. It is breath-taking. “My mission here is to spread the word about our project. I have arranged to meet a top oncologist consultant in Belfast in early May and already St Luke’s Hospital in Dublin is backing us. Brian’s first experience of the coastal walk was from Dublin Port, Portmarnock to Skerries. He said: “The coastline is magnificent to walk, I’ve been blessed with amazing weather and I have met such lovely people on Bull Island, on the Cliff Edge Walk near Howth and at Skerries. Who are ‘Daft as a Brush’? Daft a Brush Cancer Patient Care based in Newcastle-upon-Tyne offers staffed custom-made vehicles to transport outpatients, free of charge, to and from hospital who are undergoing Chemotherapy and Radiotherapy cancer treatment. The charity provides some 40,000 cancer patient journeys each year operated by over 350 dedicated volunteers. The service entails collecting and transporting patients in a safe and comfortable environment from where they are living to where they will be having their treatment. If required, a volunteer companion will stay with the patient during their Chemotherapy / Radiotherapy. We return the patient to their home in readiness for their next course of treatment. Founder, Brian Burnie is promoting the Daft as a Brush Charity nationwide by walking the entire coastal path of Great Britain and Ireland in 2 years, with a converted double decker bus called ‘Bluebell’ as his home. On his return, the charity aims to create over 1,000,000 cancer patient journeys. (Daft as a Brush Cancer Patient Care, Daft as a Brush House,Great North Road, Gosforth, Newcastle upon Tyne, NE3 2DR).